You are here: Home / wowzers / Wednesday’s Wowzers: Everything.Is.Just.So.Pretty! I am drooling right now. Seriously. No, it's not a "I'm hungry, and my mouth is watering..." kind of drool. It's the kind of drool where everything I see is just so pretty!! I think I am having crafting withdrawals because it's been weeks since I created something new. So if I can't offer you eye candy of my own, why not give you the best eye candy I can find from around the blogisphere?! Lorajean's Magazine is one of those blogs you just want to sit down and look through every post and drool. It's just.so.pretty!! 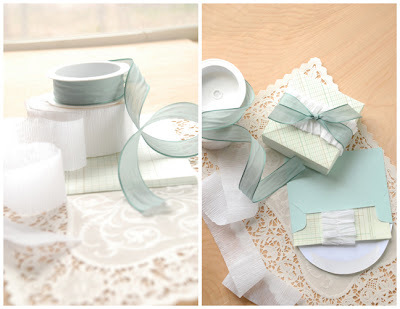 And I LOVE these ruffled crepe paper streamers--gorgeous! 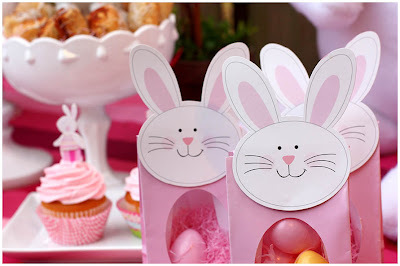 I LOVE this fun pink and yellow rabbit Easter Bunny party from Pizzazzerie. Surely I'm not the only one wondering if I can throw together a last-minute Easter egg hunt and luncheon for Little Man and his friends! 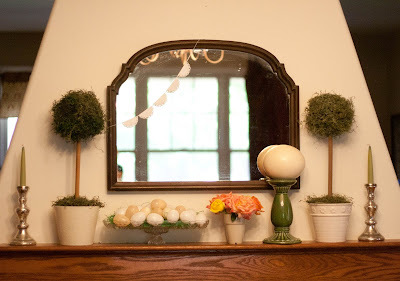 I am LOVING Kendra's (from My Insanity) spring mantel. My favorite detail is the intricate doily garland she made. And I want that mirror! Bravo! Alright--I am proud to say that I had this very same idea. Yes, Shelley from House of Smiths, and I were on the same page! 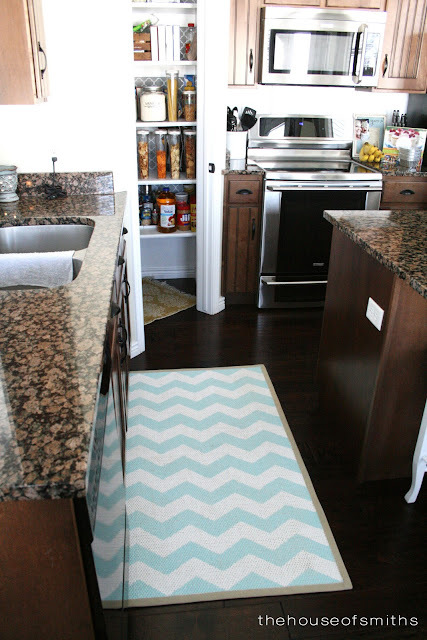 I totally wanted to paint a Chevron rug! Now I have an excellent tutorial to follow. Isn't this cute?! 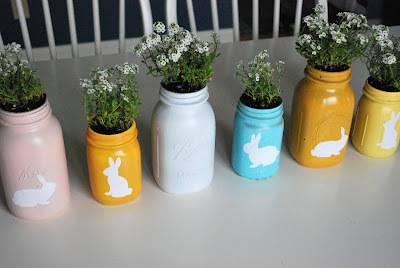 How darling are these spray-painted mason jars?! I am picturing these in my kitchen window. So fun! You can see the full tutorial at CSI Project, where Larissa from Just Another Day in Paradise is a guest.. 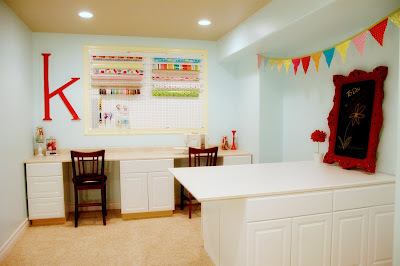 I cannot get over this gorgeous craft room at Nannygoat. Seriously! I love everything about it--but love those pennants and the chalkboard frame. Last but not least, how about a little inspiration?! 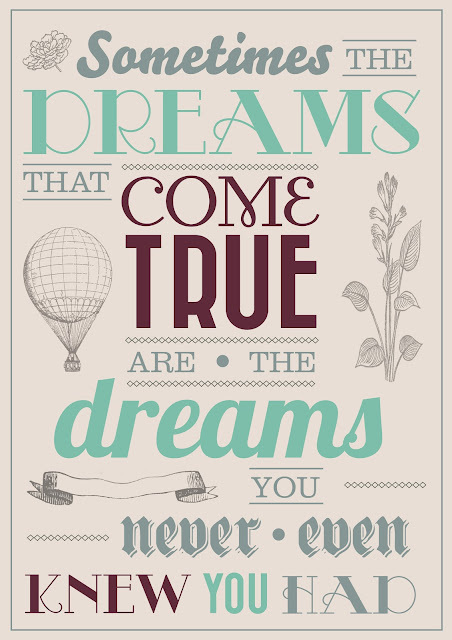 As soon as I saw this typography from Pretty Zoo, I knew it would be making an appearance in my craft room. Amazing! What has inspired YOU this week?? Thank you so much for the mention! You're so sweet! 🙂 And it was so nice meeting you TOO at Creative Estates! Cute stuff! I love those bunny boxes.